Replacement home and industrial appliance belts, outdoor power equipment belts, roller conveyor belts, machine tool drive belts, medical equipment roller belts and exercise equipment belts. L Section Rib Ace belts: 3/16" Rib Width. Poly-V (Micro-V) Rib Ace "L" Section Ribbed belts are made to replace home and industrial appliance belts, outdoor power equipment belts, roller conveyor belts, machine tool drive belts, medical equipment roller belts and exercise equipment belts. Call for additional lengths and ribs. We are updating this section. USA: (317) 519-9020. 425L5, 5 RIB Poly-V belt: Each Rib 3/16 Inch wide (Pitch). 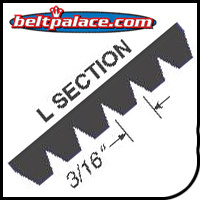 425L5 Poly-V belt: Each Rib 3/16 Inch wide (Pitch). Replaces home and industrial appliance belts, outdoor power equipment belts, roller-conveyor belts, machine tool drive belts, planer belts, medical equipment roller belts and exercise equipment belts. 460L4 Poly-V Belt, Consumer Brand. 46� Length. PL1168/460L 4 Rib Drive Belt replaces agriculture machine belts, PTO drive belts, and electric motor belts. 460L-4 Micro-V Belt. 460L10 Poly-V Belt, Consumer Brand. Metric 10-PL1168 Motor Belt. 460L10 Poly-V Belt, Consumer Brand. 46� Length. PL1168/460L 10 Rib Drive Belt replaces agriculture machine belts, PTO drive belts, and electric motor belts. 460L-10 Micro-V Belt. Replaces International Harvester Belt A-540547R1. 500L8 Belt (8-PL1270). Consumer Grade 500L-8 Poly-V (Micro-V) Belts: 50� OC Length: L Section Motor Belt replaces air compressor belts, ag machine drive belts, and electric motor belts. 500L-8 Poly-V Belt. BANDO RIB ACE 560L10 Poly-v (Micro-V) belt measures 56" (O.C.) and has 10 ribs (each rib is 3/16" wide). About the 560L10 Poly V belt: Meets RMA oil and heat resistant standards. Meets RMA static conductivity requirements. Smooth running at high speeds for minimal vibration. 615L10 POLY-V Belt (Micro V) L Section. 61.5" Length, 10 Ribs (1-7/8" Wide). Heavy Duty 615L10 Belt. 865L6 Poly-V Belt, Metric 6-PL2197 Motor Belt. 865L6 Poly-V Belt, Consumer Brand. 86.5� Length. PL2197/865L 6 Rib Drive Belt replaces agriculture machine belts, PTO drive belts, and electric motor belts. 865L-6 Micro-V Belt.